The NYOrtho Wheelchair Comfort Seats provide a soft layer of cushion and support for wheelchair users. Made from a woven polyester material called taslon and filled with micro fiber, it is hypoallergenic, making it safe for users with allergies as well as other skin sensitivities. The material is water resistant, keeping users dry during inclement weather. The wheelchair cushion also meets the requirements for the CA 117, passing both the open flame and smolder test. The NYOrtho Water-Resistant Wheelchair Seat Cushion attaches quickly and easily to the wheelchair with hook and loop closure straps, keeping it securely in place throughout use. For additional comfort, the seat cushion comes in three different lengths. Including the back rest, they can be thirty six, forty seven or fifty four inches long. 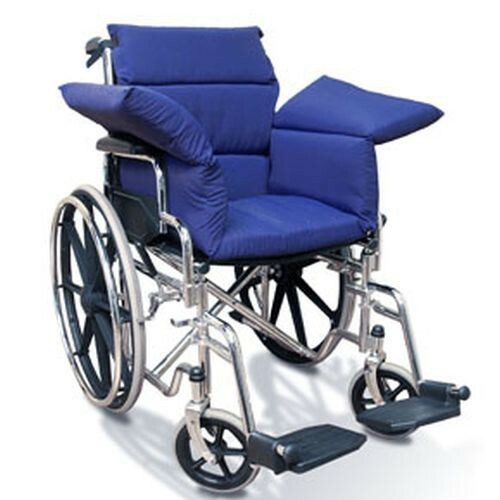 This allows users to choose comfort along the back and seat of the wheelchair or to also protect the legs. NYOrtho 9520 Series Wheelchair Seat is machine washable, making them easy to clean and to ensure proper hygiene for the user. If needed, the wheelchair pad can be used with positioning belts. This provides users with peace of mind by keeping them securely in place. However, the cushion can also be used with out a positioning belt if so desired.